Are you looking for some inspiration for festive gifts from your kitchen and garden? We’ve put together a list of our favourite festive gifts to make at home, and at schools or early years centres. We’d love to receive any of these gifts this festive season, so we’re sure your family, friends and colleagues will love them too! If you’re short on time, we also have a list of ready-made gifts from the Foundation’s online shop. 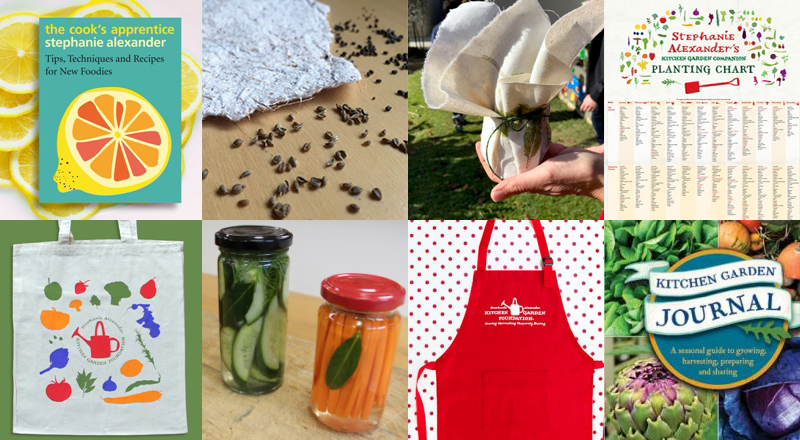 The Foundation is a not-for-profit charity and all proceeds from shop sales help us support educators to deliver pleasurable food education to children in Australia. Shop before Monday, 17 December for pre-Christmas delivery. Newspaper Planting Pots. Use recycled newspaper to make planting pots, a sustainable gift for friends and family. Plant the pots with corn, cucumber, beans or sunflower seeds, and create homemade labels for your pots. Download activity. Leaf Rubbing. Make beautiful decorative prints by placing leaves and flowers from your garden under a piece of calico and gently hammering over the flora with a rubber mallet. The prints can then be used to wrap gifts, such as the Newspaper Planting Pots above. The fabric can also be turned into beeswax wraps. Download activity. Recycled Seed Paper. Create some eco-friendly seed paper using paper scraps and seeds you have saved from your garden. The paper makes lovely festive gift cards that can be planted directly into the ground after use. Download activity. Quick Pickles. Experiment with seasonal vegetables and different types of vinegars, herbs and spices to make a batch of pickles. The pickles are ready to eat in an hour or two, and make a delicious accompaniment to festive dishes and leftovers. Download recipe. Kitchen Herb Pots. Create bright pots of herbs to dress up kitchen windowsills. Plant terracotta pots with herbs such as basil, parsley, thyme, sage and rosemary. Decorate the pots with colourful ribbons and give them away to family and friends. Download activity. The Kitchen Garden Journal. The Foundation’s Kitchen Garden Journal is the perfect gift for anyone looking for tips on growing, harvesting, preparing and sharing throughout the seasons. It includes month-by-month planting and harvesting guides, garden task ideas and recipe suggestions, and space to write planting and harvesting notes. Shop now. Stephanie Alexander’s cooking and gardening books. Our online shop has signed copies of all Stephanie Alexander’s books, including her latest release, The Cook’s Apprentice, which is a handy book for the younger cook who’s just starting out. Shop now. Kitchen Garden Foundation child’s aprons. Our Kitchen Garden Foundation aprons are sure to be a hit with budding chefs. We have some fab new red aprons, which are screen printed with the Foundation’s logo. There are also black aprons with the logo embroidered. Shop now. Stephanie Alexander’s Kitchen Garden Companion Planting Chart. This popular poster-sized planting chart provides month-by-month suggestions for when to plant seasonal vegetables in hot, temperate and cooler climates. Shop now. Kitchen Garden Foundation calico bag. Why not add one of our new calico bags to your online order, to ‘wrap’ your kitchen and garden gifts? They also make a handy and practical Kris Kringle gift. Shop now. If you need to buy a gift for the person who has everything, please consider making a donation to the Kitchen Garden Foundation. Your contribution will support our vision to help children form positive food habits for life. All donations are tax-deductible. Donate here.